Can you share your application or source code? Since I am still learning the web blogging, I am still looking for a solution to post files online; So, for now, would need the email ID for the source/binaries to be sent to you. Src file size is 209 KB and installer file size is 758 KB. Incase you do not want to post your email id here, you can always request me one at KAMRANHK_AT_GMAIL. Maslov, upon your request an email has been sent. Let me know if this works for you. i am doing some connectivity test so requires this simulator to test both ends.. 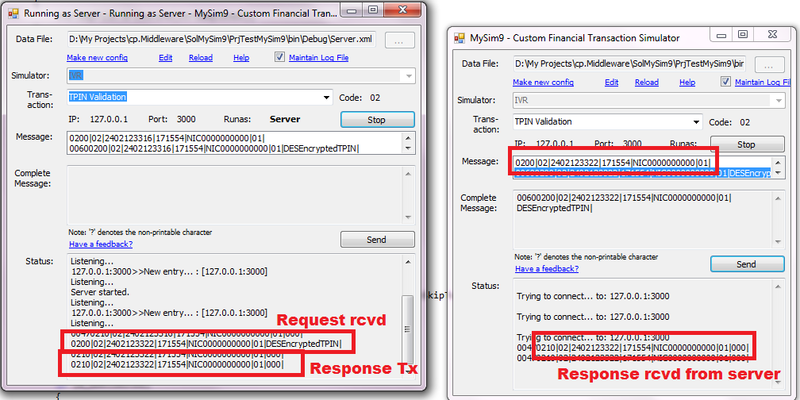 I am currently updating the solution files, will send you updated one as soon as I am done. 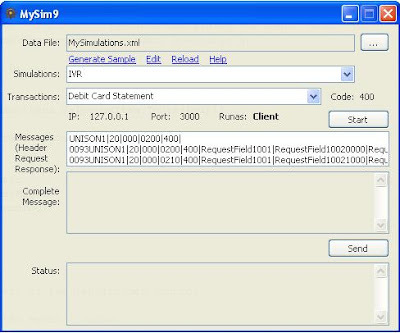 Hi, I have tried to download Mysim9: Personal/customizable simulator from codeplex but no download link. can you send me a download link at tolokunfol@yahoo.com. the solution is great & I really like this, just lack of some documentation and there should be binary setup too, to be downloaded for instant go through. Anyway, great effort, let me know if I can contribute too anything. Hi KMan, can you send me the executable to caraven90@gmail.com. I have already downloaded and compiled the source code, but when I configure the program as a server, it doesn't send any response. So I don't know if I'm compiling in a wrong way the code, or I am configuring wrong the .xml file. Finally, I would like to know if you can supply me a better documentation which explain better how work out the program. and how configure it. as I do not have the tools to compile your source code. Thank you for providing the link.could you please explain me how it is used?